The Initiative on Impunity and the Rule of Law is a joint project of the City University London Centre for Law, Justice and Journalism (CLJJ) and the University of Sheffield Centre for Freedom of the Media (CFOM). CLJJ brings together academic and research staff from the City Law School and the Department of Journalism in the School of Arts. The Initiative is sponsored by the Open Society Foundation, the Swedish National Commission for UNESCO (the United Nations Educational, Scientific and Cultural Organisation) and the Norwegian PEN Centre (part of the PEN International association of writers). It provides an independent platform to assess the effectiveness of existing legal, political and institutional safeguards against violence directed at journalists because of their professional work. It also presents a case for more effective international mechanisms to counter such crimes of violence and to end impunity for those who commit them. "The right of journalists to report freely is of vital importance to people in all parts of the world and those who use violence, assassination or detention to try and intimidate journalists must be held accountable for their actions." As documented by UNESCO, the annual toll of targeted killings of journalists and the effective impunity related to crimes of violence against them have risen to historically high levels. The Committee to Protect Journalists has identified 13 countries around the world with the worst record of violence against journalists. In those countries alone, 251 journalists were killed with impunity in the last decade. "Our project meets an urgent need for investigation into the nature and spread of all acts of violence directed at journalists because of what they publish or seek to expose... and for the development of effective measures of a legal and political kind to counter impunity. We intend that our Initiative will inform and assist efforts to implement effective international actions to end impunity for those responsible for killing, threatening or suppressing the work of journalists, editors, publishers and others who report on matters of public concern." The Initiative's research consists of two strands, focused principally but not exclusively on the European area. The first includes an analysis of the current gaps in enforcement of States' commitments, and the extent of relevant rights and obligations in law. The rights guaranteed in all general human rights instruments - right to life, personal liberty and integrity, freedom from torture, freedom of expression, right to an effective remedy - commit States to refrain from killings, ill-treatment, unlawful arrest and other interferences likely to have a chilling effect on all media operators and the population at large both at peace and in times of war. From the range of treaties and other instruments at both United Nations (UN) and regional level, it is clear that the problem of impunity is well recognised and that the description of the rights to protect journalists is complete. Thus the major hindrance for the protection of journalists derives not from the scope of the rights but from implementation deficits: States are reluctant to accept supra-national monitoring of institutions due to concerns over the erosion of State sovereignty. In addition, a lack of resources affects the establishment of effective police and judicial systems as well as the functioning of relevant international bodies. The second strand of the Initiative's research is a political aspects study, analysing alleged climates of impunity in terms of political and judicial processes, and the impact of formal and informal channels used to seek compliance with international norms and commitments. In terms of universal mechanisms, the UN Security Council's binding powers are restricted to situations amounting to a threat to the peace, a breach of the peace or an act of aggression, but there is no general competence to take action against countries where killings and intimidating acts occur in peacetime. Regional systems however have established more far-reaching enforcement mechanisms, through regional courts issuing binding judgments on individual complaints. The Initiative has proposed a set of new instruments and procedures aimed to enforce journalists' rights worldwide. The research team, which includes Professor Lorna Woods, Director of Law for the CLJJ, Dr Carmen Draghici, Lecturer in Law, and Dr Dimitris Xenos, Researcher in the City Law School, believe that a specific instrument for the protection of journalists appears justified on account of their vulnerability as a category and the impact of attacks against them upon the public's right to information and democratic control over ruling elites. The success of conventions for special categories (children, women, minorities, disabled) or rights (protection against torture, non-discrimination) confirms that they attach particular stigma to violations. The stronger option is a convention negotiated within the UN General Assembly or the UNESCO General Conference, systematising and detailing existing obligations in respect of media workers. Such a global instrument would cover regions with modest inter-governmental cooperation and set uniform standards, reflecting the trans-border dimension of the phenomenon of violence against journalists. An ad hoc body of independent experts monitoring compliance of a convention of this nature would allow for a more expeditious procedure and avoid the loss of political pressure ensuing from the fragmentation of initiatives. A further option would be to expand the prerogatives of existing bodies, for example, amending the statute of the UN Human Rights Council to remove the prior consent requirement for country visits, and to introduce a mechanism of complaints for less exceptional cases. The powers of regional courts could be amended to include a priority procedure (modelled after the EU post-Lisbon speed procedure for persons deprived of liberty) in media violations cases, given their wide public implications for freedom of expression. While none of these solutions is immune from objections in terms of desirability or feasibility, the legal inertia of the international community is likely to perpetuate the status quo, despite the notional existence of rules prohibiting violence against journalists and unwarranted interference with freedom of expression. These highly pertinent issues are addressed in a report on the research findings titled The Initiative on Impunity and the Rule of Law: Safety and Protection for Journalists: A Responsibility for the World (2011. CLJJ, City University London and CFOM, University of Sheffield), published following a major international working conference held at City in June 2011. The project team are confident that the Initiative's research and the conference's recommendations will continue to inform and influence decision-making by State governments and international organisations and will ultimately lead to concrete action by the international community that will end impunity for those responsible for killing or threatening of journalists. Find out more about research undertaken by the City Law School. 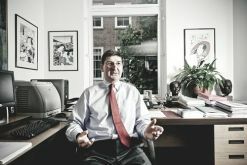 Professor Adrian Keane, a Barrister and Director of Professional Programmes for the City Law School, is providing expert advice on improving a controversial new set of evidence rules for death penalty cases as part of a project team set up by the Chinese Centre for Criminal Procedure Reform, based at Renmin University, Beijing. The team is also developing a further set of guidelines, to be used in all criminal courts in China, for the exclusion of confessions obtained by illegal means. "The focus of my research for this project has been to identify solutions to the difficulties in the drafting and implementation of rules designed to exclude evidence obtained by torture or otherwise illegally, improperly or unfairly." As part of his new role, Professor Keane will meet and address judges from across China, as well as other law academics, at two seminars in Beijing in 2011 and 2012. His participation has been coordinated by the Great Britain China. Centre and has been funded by the UK Foreign Office. Professor Keane is an internationally-recognised expert in the law of evidence whose text, The Modern Law of Evidence (Keane, A., Griffiths, J. and Mckeown, P., 2010. Oxford University Press), has been cited not only by the House of Lords and the Privy Council, but also in courts around the world, including the Supreme Court of Canada and the UN War Crimes Tribunal in Rwanda.Professor Keane's other areas of research include the use at trial of scientific findings relating to human memory and whether they point to some types of evidence, for example, evidence about events occurring during one's very early childhood, being so unreliable that they should not be accepted without independent corroboration, and a groundbreaking critical analysis of the rationale, scope and complexity of the rules relating to leading questions in examination-in-chief and cross-examination.